Marginalised Texts: The Old English Marginalia and the Old English Bede in Cambridge, Corpus Christi College 41. Bede was a prolific writer in Anglo-Saxon England who, over the course of his prodigious literary career, produced a diverse range of Latin texts encompassing educational and scientific treatises as well as Biblical commentaries. Out of all his Latin works, Bede’s Historia Ecclesiastica Gentis Anglorum (The Ecclesiastical History of the English People) is regarded as his greatest achievement, as it provides significant insights into a largely undocumented period in English history. The Historia Ecclesiastica was translated into the vernacular sometime in the late ninth or early tenth century and this translation is commonly referred to as the Old English Bede. The Old English Bede survives in five extant manuscripts, dating from the mid tenth and late eleventh century: Oxford, Bodleian Library, Tanner 10; London, British Library, Cotton Otho B. xi; Oxford, Corpus Christi College, 279; Cambridge, University Library Kk. 3.18 and Cambridge, Corpus Christi College, 41, the last of which is the focus of this article. Cambridge, Corpus Christi College, 41 is dated to the first half of the eleventh century and is distinguished from its fellow Old English Bede manuscript witnesses by the extensive number of Old English and Latin texts that are written into its margins. I have provided an image of a page from Cambridge, Corpus Christi College, 41 which illustrates how extensive these marginal texts, which will henceforth be referred to under the collective term marginalia, are in this manuscript. Figure 1: The Old English wisdom poem Solomon and Saturn, CCCC MS 41, p. 196. Reproduced with permission from the Master and Fellows of Corpus Christi College, Cambridge. It is clear from the above image that the scribe responsible for these marginal texts made very effective use of the manuscript’s spacious margins. Here on p.196 the text of an Old English wisdom poem Solomon and Saturn occupies the manuscript’s upper, outer and bottom margins, completely surrounding this section of the Old English Bede. My work aims to explore how the Old English marginalia influences and affects our reading of the Old English Bede by reading the Old English marginalia in relation to their physical and thematic relationship to the body text, in order to arrive at a more informed understanding of the possible purpose of these marginal texts. The objective of my research is to argue against the idea that the physical relationship between the marginalia and the Old English Bede is coincidental and to assert the possibility that these marginal texts may have been meant as intentional textual additions to the passages of the Old English Bede they are written beside. This reconsideration of the marginalia will be an important contribution to the study of Old English literature as it will be the first all-inclusive reading of Cambridge, Corpus Christi College 41 which incorporates both the principal text and the marginal Old English texts that were copied after the Old English Bede’s completion. Reconciling the marginalia with the principal text will yield new insights into the Old English Bede and into the marginal texts themselves, as this will be the first time that the manuscript’s internal textual relationships will be fully acknowledged and addressed. What Have Charms Got To Do With The Old English Bede? A charm is generally understood as a device that is used to produce a desired result through the solicitation of non-human intervention, be it via magical means or divine intervention. The word charm conjures up associations with the linguistic fallacy of magic, the notion that words can have a tangible effect on the real world. This tangible effect was achieved through a chant or incantation which was often spoken in the vernacular or in Latin and appealed to Christ, the cross or other saints. The Old English charms found in Cambridge, Corpus Christi College 41’s spacious margins continue to excite scholarly discussion because of their seemingly incongruous relationship with the Old English Bede. The charms within Cambridge, Corpus Christi College 41 form a curious mix, being comprised of a charm to pacify a swarm of bees, three charms to use in the event that goods or livestock are stolen, and a Journey Charm. The concise instructions of the charm to tame a swarm of bees, commonly referred to as the Bee Charm, direct the reader or practitioner through a two-step ritual and vernacular incantation that seeks to subdue a swarm of bees. The next charms that the reader encounters in a linear reading of the manuscript are the three charms concerned with stolen possessions or livestock and are collectively known as the Cattle Theft Charms; these charms address the issue of stolen livestock or property to varying degrees. The first two Cattle Theft Charms have more of a focus on recovering the stolen cattle or revealing the location of the stolen cattle, while the final charm places a stronger emphasis on the punishment of the thief. Each of the Cattle Theft Charms achieves its desired result through incorporating a Latin incantation that appeals to Christ, the cross of Christ and certain saints. The final and longest charm written into the manuscript, the Journey Charm, implores supplication from Christ and the Apostles for personal protection throughout the duration of a person’s life. What, then, does such an eclectic collection of charms have to do with Bede’s Ecclesiastical History of the English People? By reassessing each charm’s individual manuscript context my work will not only provide a more informed insight into the charms’ textual relationship with the Old English Bede, but will also provide interesting insights into how and why these charms were used in Anglo-Saxon England. Martyrs In The Margins: The Old English Martyrology In The Old English Bede. The Old English Martyrology provides the earliest vernacular account of martyrs venerated by the Christian faith. Organised according to the Christian calendar, the Old English Martyrology not only identifies the saint’s feast day but supplements the anniversary by adding historical information about their lives including details about their miraculous works and their martyrdom. The Old English Martyrology was a text of considerable evangelical and pedagogical import as it was primarily used to inform its readers about the cults of local and foreign saints. Unfortunately, despite its obvious educational value, the Old English Martyrology has not survived in its entirety, but was reconstructed from its four fragmentary manuscript witnesses, one of them being Cambridge, Corpus Christi College 41. Cambridge, Corpus Christi College 41 preserves the shortest extract from the Old English Martyrology which includes brief notices on the Birth of Christ, St Anastasia, St Eufemia, St Stephen, St John the Evangelist, The Holy Innocents and an incomplete account of St Silvester within the Old English Bede’s ample margins. In spite of the brevity of these notices, this small fragment in Cambridge, Corpus Christi College 41 is invaluable as it is the only manuscript containing this part of the Old English Martyrology, specifically the feast day notices for 25th – 31st December. My research endeavours to examine the impact this invaluable portion of the Old English Martyrology has on our reading of the sections of the Old English Bede it accompanies and determine whether this short sequence has any thematic and contextual relevance to the Old English Bede. Is There Anything To Be Said For...Adding Another Homily? A homily on the Passion of Christ. What is interesting about this selection of homilies is that practically all of them can be classified as examples of apocryphal literature, which is essentially literature that contains material that is not derived from the Bible. Interestingly, like the Old English Martyrology, the majority of the homilies are only preserved in Cambridge, Corpus Christi College 41. Indeed out of the six homilies listed above only the first and fourth homilies can be traced to different manuscripts. 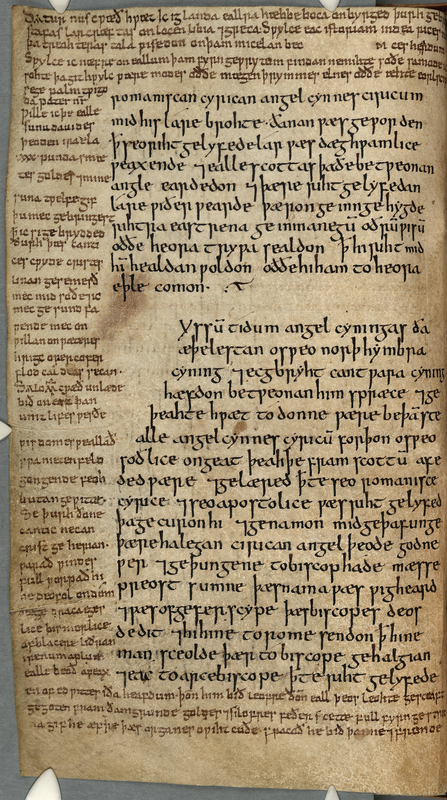 The uncanonical content of the Assumption of the Holy Virgin, Judgement Day, St Michael and the Passion homilies may be one reason why they are found in no other manuscript in the Old English corpus. The primary objective in studying these apocryphal homilies is to investigate whether there are any conclusive thematic or contextual connections to the sections of the Old English Bede that they accompany. Their inclusion within the Old English Bede may have been intended to offer more insight into the place and function of apocryphal homilies within the church and more specifically, within an evangelising environment. In the late ninth and early tenth century Bede’s Historia Ecclesiastica was translated into Old English to make this important text more accessible to a wider audience. In a similar vein one could reasonably conjecture that rendering these homiletic texts into the vernacular made homiletic literature more accessible for the lay community. It could also be argued that the apocryphal elements within these homilies could have performed a similar function as the heterodox material would have been more effective in edifying the laity. This is reasonably well-founded as apocryphal texts enjoyed a wide circulation throughout Anglo-Saxon England at this time. Interpreting these marginal homilies in relation to their placement within the Old English Bede will help to establish the influence and utility of these homilies within the Anglo-Saxon Church. Unlike today, the classification of literature was less rigid in medieval culture, it is probable that for some clergy members these apocryphal homilies may have been useful evangelical tools and as such that these marginal homilies were considered as practical and welcome additions to the Old English Bede. Ultimately my research proposes to adopt a more inclusive framework for interpreting the Old English Bede, which is in favour of including the marginal texts in our reading of Cambridge, Corpus Christi College 41. This holistic style of reading the Old English Bede will provide an innovative insight into the early medieval textual culture that not only produced Cambridge, Corpus Christi College 41, but read, studied and added to this manuscript as well. My research will differ from previous research on Cambridge, Corpus Christi College 41 as it will seek to reconcile the marginalia with the Old English Bede; this has not been attempted in the standard edition of the Old English Bede produced by Thomas Miller. Although Miller recognised the significance of the Latin and Old English marginalia, he did not address the marginalia’s relationship with the principal text. In his edition of the Old English Bede the marginalia is isolated; removed from the chapters it accompanies in the Bede and placed in his commentary alongside the other variants of the Old English Bede. Miller’s decision reflects modern linear reading practices and is a direct consequence of prevailing editorial norms. The approach that underlines my research however is grounded in an appreciation of the variances that characterised manuscript culture. Consequently, this study has encouraged a renewed appreciation of Cambridge, Corpus Christi College 41’s assorted manuscript context by demonstrating the cultural and thematic insights that are to be gained through a holistic reading of the manuscript. When considering a manuscript containing as diverse a collection of charms, martyrologies and homilies as Cambridge, Corpus Christi College 41, it is important to note that Anglo-Saxon compilers may not have shared our present preoccupation to compartmentalise texts and perhaps possessed a different rationale for recording these seemingly disparate texts together alongside the Old English Bede. Adhering to modern reading and publishing practices in studying this early medieval manuscript increases the likelihood that the rationale behind these curious reading and scribal practices will remain obscure. The scope of my research is presently limited to the relationship between the Old English marginalia and the sections of the Old English Bede that they accompany. I have yet to determine the possibility of similar thematic and contextual correspondences existing between the Latin marginalia and the Old English Bede within Cambridge, Corpus Christi College 41. There is much to be gained from future research focusing on an all-inclusive reassessment of the intriguing relationships inherent in Cambridge, Corpus Christi College 41, as this different perspective would greatly enhance our understanding of the textual world of the Old English Bede. With gratitude to my supervisors Dr. Thomas Birkett and Dr. Orla Murphy.